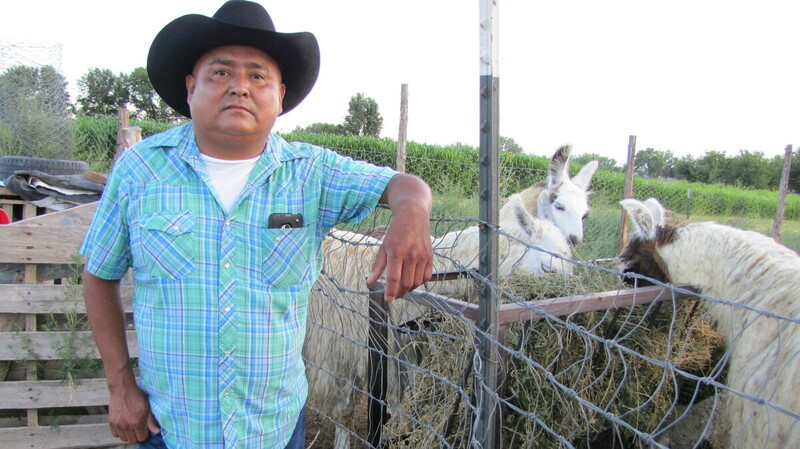 Navajo Nation Farmers Feel The Weight Of Colorado Mine Spill The spill of heavy metals into the Animas River has contaminated water for hundreds of farmers in the Navajo Nation downstream, bringing up memories of past environmental disasters. After the Animas River spill, rancher Irving Shaggy is forced to travel a 70-mile round trip to get water for his livestock. "It's going to be a long struggle," he says. Initially the agency downplayed the incident and provided little information. So Navajo President Russell Begaye traveled to the source of the toxic spill and posted a video of it on Facebook. In the video, he stands in front of the still-leaking mine. "This is the story that was related to us just now," he says. "The person was working the backhoe and trying to block off more of this area, but then he saw a spring ... and the water burst through here and it went straight down the mountain." The mustard-colored water then flowed downstream to the Navajo Nation in New Mexico. The Navajo Farming Authority has shut off public water intakes and irrigation canals, leaving hundreds of Navajo farmers driving long distances to water their crops. It's where rancher Irving Shaggy gets water for his family's livestock and to irrigate his fields. "[I've] been growing sudangrass for my cattle and sheep, which is our livelihood," Shaggy says. "We sell the wool; we sell the cattle every year." But Shaggy doesn't know if his cattle will be contaminated and unsaleable. He fights back angry, tired tears at the disruption of his usual routine. "I mean, I'm upset, mostly because every two days I haul water to my livestock," he says. "And I get it from the river and I irrigate my fields." Now, he says, he has to make a 70-mile round trip to get water. "I can't irrigate," he says. "It's taking a lot out of me cuz I've been hauling out of the other river and that costs a lot of money." Shaggy says the EPA isn't providing enough clean water or enough information, leaving him and hundreds of other farmers to speculate about the rest of the farming and ranching season — and the future. "It's going to be a long struggle," he says. "The water's still contaminated and it's embedded in the mud and the rocks and the tree branches along the river." This contamination brings up memories of other environmental disasters caused by the federal government. One in particular that Navajo people are talking about is uranium mine contamination — a decades-long legacy that still affects people on the reservation today. The EPA has only started in the last seven years to clean up those mines. At an EPA meeting at the Shiprock Chapter House last week, a farmer spoke angrily to EPA representatives. "These folks here are hurt," he said. "They're connected to the land. They're connected to the water. We can't be compensated for that. We can't be compensated for all the prayers that was given to that water of life." "We are working hard very hard to get this right," answered EPA emergency responder Randy Nattis. "I'm frustrated. I know everyone here is frustrated. I haven't slept. No one has slept since this has happened." The Navajo say it's difficult to trust the EPA when agency workers spent much of last week handing out forms to the farmers that would essentially waive their rights to sue the federal government for future damages. The Navajo president said in a statement, "The Feds are protecting themselves at the expense of the Navajo people and it is outrageous."